In the United States Constitution there are three requirements a person must fulfill to be eligible for the presidency. Candidates must be at least 35 years old, have 14 years of residency within the U.S., and be a natural born U.S. citizen. There are no education requirements to become the president, and when you look at the educational history of the 43 men who have become president so far, it is obvious. Some presidents have degrees from public universities while others graduated from the most prestigious private colleges in the world. Several have graduate degrees, while 12 have no formal degree whatsoever, including some of the country's best and most famous presidents such as Abraham Lincoln and George Washington. Many presidents earned law degrees while only Woodrow Wilson gained his Ph.D. Presidents went to small schools and large research universities all over the U.S., some playing football and others transferring to different schools after only a year or two. Many presidents learned law without a formal degree, and every president since Dwight Eisenhower has had at least a bachelor's degree. 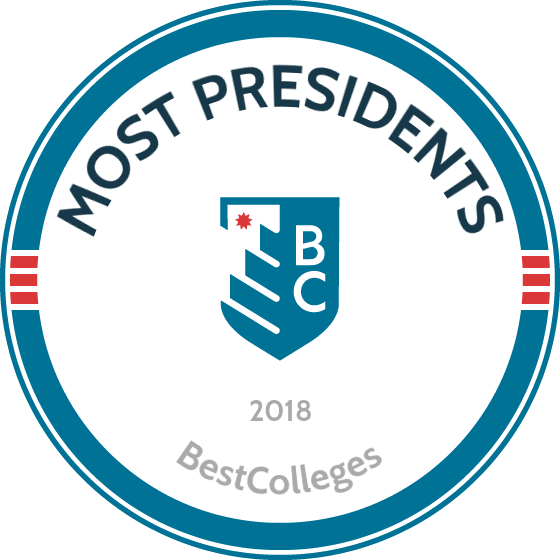 Learn more about presidential education history and trends by checking out the Top 10 Colleges for Presidents and Vice Presidents. The Top 10 list looks at where every president who went to college attended and ranks the schools with more presidents or vice presidents higher. Not all of the presidents who attended these schools received a degree there, and many went for graduate school but not undergraduate or vice versa. Founded in 1636, Harvard University in Cambridge, Massachusetts, has existed significantly longer than the office of the president or the United States itself. It has seen the most future presidents out of any school. The first president to hold a college degree, John Adams, graduated from Harvard, as did his son and future sixth president John Quincy Adams. Teddy Roosevelt, Franklin D Roosevelt and John F Kennedy also received undergraduate degrees from Harvard. Several other presidents attended this prestigious university for graduate school. Rutherford B. Hayes received his law degree from Harvard after graduating from Kenyon College in his native Ohio. The most recent graduate, Barack Obama earned his law degree in 1991 at Harvard Law where he served as an editor of the Harvard Law Review. Obama’s predecessor, George W. Bush graduated from Harvard Business School and was the only president with a business school graduate degree. In addition to Teddy Roosevelt and John Adams, vice presidents Elbridge Gerry and Al Gore also attended Harvard. While Harvard was popular with the Adams and Roosevelt presidents, the Bushes and Clintons attended fellow New England Ivy League school Yale University. William Howard Taft, George H. W. Bush and George W. Bush all attended Yale for undergraduate studies while Gerald Ford and Bill Clinton earned their law degrees at the New Haven university. That means for 20 year from 1989 through 2009 the president had earned at least one degree from Yale. Former first lady Hillary Clinton also attended Yale Law School. Taft was on the faculty of both Yale and Yale Law in the early 1900s. The earliest president or vice president to earn a degree from Yale was fiery South Carolina senator John C. Calhoun, who served as vice president for two terms, one under John Quincy Adams and another under Andrew Jackson. Although he never became president himself, Calhoun ran for the highest office and was a major player in early 1800s politics. Calhoun College at Yale is named for him. Originally founded as a royal English college in the 1600s, William and Mary is the second oldest higher education institution in the U.S. The Williamsburg, Virginia research university is now a “public ivy,” but when former presidents Thomas Jefferson, James Monroe and John Tyler attended the school was private. Jefferson and Tyler served both as vice president and president. A popular and prestigious school for early American founders, William and Mary was also attended by former speaker of the house and presidential candidate Henry Clay as well as Supreme Court Justice John Marshall. Although George Washington did not receive any formal college degree, the first president did earn a surveyors certificate from William and Mary and was the chancellor of the school in the late 1700s. John Tyler was also a chancellor of the college. Before becoming the 28th president of the United States, Woodrow Wilson was the 13th president of Princeton University. In addition to being the president of the school, Wilson was also a professor at the university teaching politics and law and earned his undergraduate degree there. The famous Woodrow Wilson School of Public and International Affairs now bears his name. Author of the U.S. Constitution and fourth president James Madison also graduated from Princeton, while John F Kennedy attended the school briefly before transferring to Harvard. Vice presidents Aaron Burr, George M. Dallas and John C. Breckinridge all graduated from Princeton, and Grover Cleveland served on the school’s board of trustees after being U.S. president twice. Two of the most important military generals in the history of the United States attended the Military Academy at West Point and later were elected president. Ulysses S. Grant, the lead general of the Union army during the victory in the Civil War, graduated from the New York academy long before he was elected to succeed Andrew Johnson as president. Dwight D. Eisenhower was the Supreme Allied Commander of forces in Europe at the close of World War II, where he helped lead the U.S and the Allies to victory and a 5-star general. He was elected President in 1952 and served two terms. Eisenhower also graduated from the United States Army Command and General Staff College, United States Army Industrial College and United States Army War College. The only other president to have attended a U.S. military academy was Jimmy Carter who graduated from the U.S. Naval Academy. Barack Obama transferred from Occidental College to Columbia University in New York City in 1981, where he graduated with a bachelor’s degree. However, he is not the most recent president to receive a degree from the Ivy League school. Former presidents Teddy and Franklin Roosevelt were awarded posthumus J.D.s from Columbia Law School in 2008. Each had attended the school in the late 1800s and early 1900s respectively, both withdrawing before completing the degree. Also, before becoming president in 1953, Dwight Eisenhower served as president of Columbia University for a few years. Daniel Tompkins, vice president under James Monroe, is the only vice president to attend Columbia. Depression Era president Herbert Hoover started at Stanford University in 1891, the same year that the California school was founded. Hoover may have even been the first student ever at the school. He earned a degree in geology and led a life of mining and humanitarian work before being elected president. The Lou Henry and Herbert Hoover house is now the official residence of the president of Stanford and a number of Hoover-related monuments and artifacts are on campus such as his lecture notes. John F. Kennedy enrolled at Stanford University’s Graduate School of Business, but withdrew before graduating. James K. Polk, the 11th president of the United States, was the only speaker of the House of Representatives to be elected to the highest office and the only president to graduate from the University of North Carolina’s flagship campus in Chapel Hill. As a transfer student, Polk excelled at the school which, at the time, had a very small student body. He graduated and studied law in Tennessee. Today, a section of UNC’s campus is named for Polk, who is among the U.S.’s most famous presidents for expanding the size of the country significantly. Texas was admitted to the Union as was the Oregon territory, both adding plenty of land where future universities and colleges would be established. William R. King, who was vice president under Franklin Pierce, a few years after Polk also graduated from UNC. With only about three-fourths of presidents going to college and so many of them going to Harvard and Yale, there are a few other schools that have graduated multiple presidents or vice presidents. Many presidents went to small private schools including Williams College, Amherst College and Bowdoin College. Georgetown University, in the nation’s capital, has handed out a degree to one future president and taught another for a short time. Bill Clinton earned his undergraduate degree at Georgetown University before attending Yale Law School and Oxford University as a Rhodes Scholar. Lyndon B. Johnson, who was a vice president under John F Kennedy as well as a president himself, attended Georgetown’s law school before dropping out. Although not a single U.S. president graduated from the University of Virginia, several were instrumental in its founding. The Charlottesville, Virginia school was established in 1819 by Thomas Jefferson years after he had completed his two terms as president. Jefferson along with former presidents James Madison and James Monroe were some of the first to serve on the university’s board. Jefferson and Madison were UVA’s first rectors. Much later Woodrow Wilson enrolled at the University of Virginia’s School of Law, however he left without graduating. Former U.S. senator and vice president Alben Barkley graduated from UVA’s law school in 1900.